ATMA 2019 – The Association of Indian Management Schools (AIMS) is now going to conduct the AIMS Test for Management Admissions (ATMA) 2019 on May 25, 2019, at the allotted exam centres. The application form for the ATMA 2019 is available on the public domain atmaaims.com. ATMA is the national level examination which offers admission in courses such as MBA, PGDM, PGDBA, MCA, and other postgraduate management courses. The validity of this entrance exam is applicable in more than 200+ high ranking institute in all over India. The aspiring candidates can appear for the test ‘N’ number of times as well. To know more on ATMA 2019-20 exam session, candidates must scroll down to read. Latest: The ATMA 2019 schedule has been revised. Scroll down to check the same. 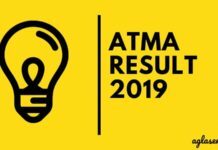 This year ATMA will be held 5 times (Dec 2018, Feb 2019, May 2019, Jun 2019, and Jul 2019). Latest updates on this page are for the ongoing ATMA exam. Candidates can go through the schedule given below for the same. All the official dates regarding the ATMA 2019 May examination have been released by the AIMS on its official website. Candidates should fulfil all the eligibility criteria laid down by the official examination conducting body. Hence, they should make sure that they go through the information brochure before they apply for the same. The application invites of non-eligible candidates will not be accepted by the University at any cost. Candidates applying for the examination should be Indian Nationals. The student must have completed their graduation from a recognized university. The format of the completion should be 10+2+3. Candidates must have scored a minimum aggregate of 50% marks in their graduation examination. Students in the final year of the qualifying examination can also apply for the exam. 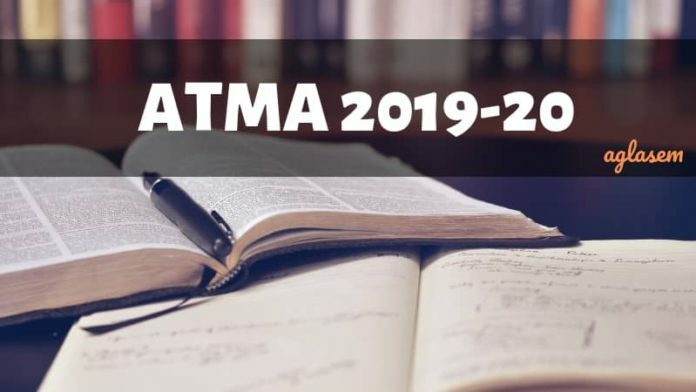 The online registration for ATMA 2019 May exam has been started on its official website. It is compulsory for the candidates to enter valid email id and date of birth while registering for the examination. Candidates have to register separately for the different times as the ATMA exam is conducted fives time for the postgraduate admissions. Once, the candidate has successfully registered and paid the required, they will get an auto-generated mail which has the login credentials for the candidate i.e. username and password. 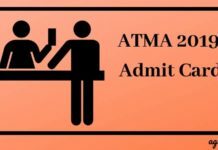 The registration fee for ATMA 2019 exam is Rs. 1298/-. The candidates can pay the application fee by online mode using Credit Card/ Debit card only. Note: The application fee is not refundable or transferable to other tests under any condition. The admit card of ATMA can be downloaded from the official website. No hard copy fo the ATMA Admit Card is sent to the candidates by post. Hence, to download it, the aspirants need to log in by entering details such as PID (Personal Identification Number), Password, etc. The candidates will get two admit cards. One is the candidate’s copy and the other one is to be submitted to the invigilator. Candidates will have to carry both the copies and need to ensure that the details mentioned on it are correct. Along with the ATMA Admit card for the concerned month’s exam, the candidates also need to bring along a relevant id proof for the verification process. NOTE: It is mandatory for all the appearing candidates to bring the ATMA hall ticket at the exam centre else the concerned authorities of the exam centre will not allow them to sit and write. Candidates must go through the exam pattern before going to start the preparation for the entrance. Through the exam pattern, candidates can get to know about the marking scheme, type and number of questions, time duration and many more. The table below lists the expected test cities for the ATMA exam. This information is obtained from the information brochure of ATMA 2019-20. The AIMS publishes the ATMA result on its official website. The candidates should note that AIMS do not send the hard copy of the ATMA Result by post. Candidates would have to log in to the candidate portal by entering the details such as PID and Password to access the result. The exam conducting body does the evaluation of the ATMA result as per the marking scheme. It is advised to the appearing candidates to preserve their result as it shall be needed for further admission rounds. There are more than 740 participating institutes of ATMA. After the announcement of the result, the qualified candidates will be called for the Group Discussion and Person Interview. The GD and PI round is organized by the individual institute on its own. Each institute issues a call to the candidates, which is to be sent online. Click here to download List of Participating Institutes with their code numbers. Mock test for the preparation of the exam is available on the official website. Candidates can give the mock test through the link provided below. Candidates who are applying for the ATMA exam an download the Sample Question paper from the below links. For more details regarding the ATMA 2019, Download Information Brochure.